THE SFA Referees Edinburgh and District Branch have announced two new referee classes for 2007. The classes will run in the Midlothian and West Lothian areas and are the only way to reach the top in refereeing in Scotland. "It has been a highly successful year for Edinburgh and District referees," explains referee coach Neil McLennan. "Not only have we gained some excellent new recruits from both these areas in previous courses but 2006 has also seen a number of high profile appointments. At youth and amateur levels there have been a number of successes. Douglas McDonald however leads the way with his appointment to the Scottish Cup Final. The feedback from our recent new recruits has been very positive so far... who knows, one of them might go on to emulate Dougie's success in the years to come." There is still however a need for referees to service football in both these communities. The courses are free of charge and are open to anyone over the age of 16. The referee is the 23rd man on the field of play and his contribution to the sport is sometimes not given the recognition it deserves. The attributes required of a referee are many, but first and foremost he will be a football enthusiast with a deep desire to be involved in the best team sport in the world. He will know the Laws of the Game backwards but equally as important is the ability to apply them fairly and skilfully. Ewan- let me know if you want to arrange a photo shoot. Calum Murray (FIFA Referee) is in the area and can be arranged along with some of our new entrants from the last WL class if required. DO you think you could do better than the World Cup referees? If so, all budding whistlers can take the first steps to achieving this aim at a Scottish Football Association referee course at Beeslack High School in Penicuik, starting in the new year on Monday, January 29. The course is for those new to refereeing and runs for ten weeks, from 6.30pm to 9.00pm. The course is open to those aged 16 years and over, and is free to new entrants. 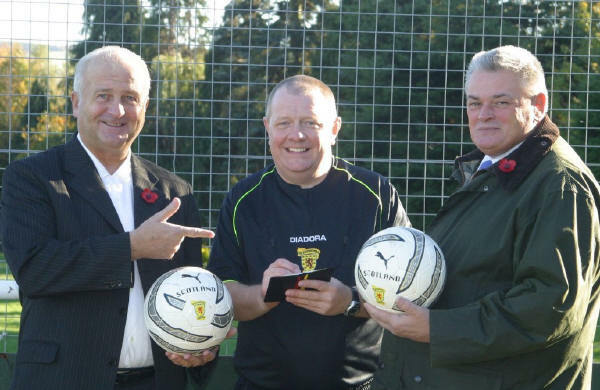 Midlothian Council leader, Adam Montgomery and cllr Bob Jenkins are helping to promote the course as referees are vital to the game continuing - but it is an ongoing battle to get people involved. Cllr Montgomery said: "There is a worldwide referee shortage and so it's vital as many people as possible get involved. There is more pressure than ever before as women's football is now one of the fastest growing sports, therefore further stretching resources." Cabinet Member for Leisure, Sport and Recreation, cllr Jenkins said: "There has never been a better time to become a referee and for those interested in working in the minor leagues there is no shortage of appointments at all levels. Previous midweek courses at this venue have been highly successful and it is hoped that it will again attract high numbers from the Midlothian area and beyond." For more information or inquiries regarding the Midlothian class, call David Gordon on 0131 660 1078, or email coach@edinburghrefs.com. The ten-week course builds towards two exams, one written and one using questions, diagrams and video clips. On passing both of these exams, a candidate then becomes a probationary referee and referees two games by each candidate under observation. help referee David Gordon promote the course.